Tom Lutey and Larry Mayer from the Billings Gazette spent some time with us recently. Below is and exerpt from their article. 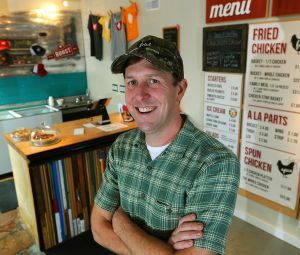 The Roost, a new fried chicken restaurant that’s Southern down to its cheese grits and boiled peanuts. The 1520 W. Main St. location sports only an open sign in a window fronting Bozeman’s busiest street and an red off-street sign with its moniker. The restaurant’s easiest entrance is 20 yards to the east in what doubles as a ski shop parking lot. In spite of this, The Roost is standing room only at lunch time. Darr, whose family has operated barbecue and fried chicken restaurants in Tennessee since the 1950s, was working for an organic and natural foods distributor before opening The Roost. He used family recipes for roasted and fried chicken and some key contacts in food distribution to produce an offering like no other in Montana. In November, customers were lining up for the “Nashville Burn,” a deceptively spicy fried chicken that goes down easy but five minutes later raises sweat beads on the nape of customers' necks. The Roost has less spicy options than the Nashville Burn, but everything has a little heat to it and goes well with a glass of iced sweet tea.